I love Red Ribbon cakes too. The dough is siksik and chewy like brownies. I agree with you that cakes from Red Ribbon is better compared to Goldilocks but with slight higher price. I love both bakeshop. 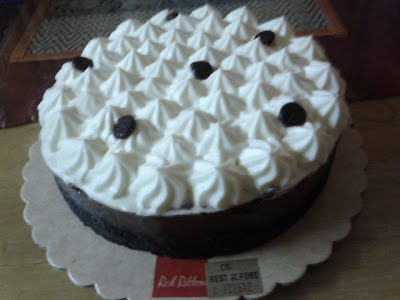 I was so touched that my 16 year old son bought the Black Forest cake from Red Ribbon as a birthday gift for his Dad and also he gave me one on mine! So touching for the thought and the effort! Yum I love their palabok. I also prefer Red Ribbon over Goldilocks when we were still in Manila. The problem is there is no Red ribbon store here in Bohol :( I discovered that when we bought my daughter's birthday last year, we could not find Red Ribbon store so we settled for Goldilocks. I love and miss red ribbon cakes. I also lile goldilocks kc i love the sheer taste of their rolled cakes. That looks like a really yummy cake to eat :) Makes me hungry looking at it. You should try their ube cake too. I am not so fond of ube but when it is Red Ribbon's ube cake, I'll have a slice anytime. i think I already tasted this cake since every friend's b-day has a surprise cake. I am fond of red ribbon or goldilocks. both have a great taste. Hay Red Ribbon, I so miss you!!! Visiting from CommEx 10/30. We used to buy this flavor every birthday in our family. Now, we try other new ones as well. I also prefer Red Ribbon cakes, but Goldilock's is more accessible. Kaya we only buy RR when we go to the mall. Every weekend, Goldilock's kami kasi may malapit na branch dito sa amin. I remember during college days, me and my barkada used to eat in Red Ribbon kasi pasok sa budget ung mga meals nila. Visiting from CommEx 10/30 posting as "Omlialie". All cakes in Red ribbon ay masarap... for sure this one too... Sweet friend giving some cakes on bday. Wow love that chocolate mousse cake. 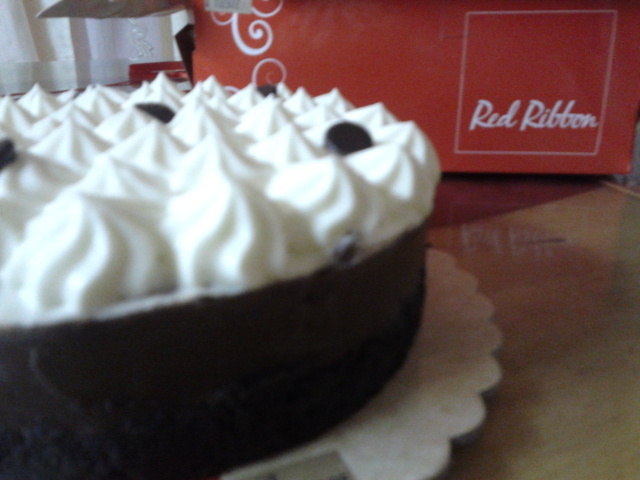 I love Red Ribbon's cake. Red Ribbon is THE BEST! I think Red Ribbon is taking the CAKE scene here in the Philippines. Goldilocks is now 2nd to them.